Diminishing sea ice has opened the Arctic to navigation and operations like never before. Forecasters are increasingly predicting weather in support of those operations. 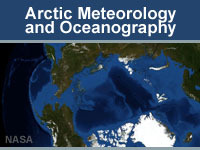 This module is intended to provide forecasters with a brief introduction to the Arctic, including its geography, climatology, and the forecast problems they are likely to encounter. The module follows a U.S. Coast Guard Cutter on a voyage from Dutch Harbor, in the Aleutian Islands, to Barrow, on the north coast of Alaska. Various topics are addressed along the way in a series of short, stand-alone lessons. Fun and interesting stuff to learn about very informative . A great brief overview of the key information. this is on the job training for me, as im the team leader of national inter-agency baer team-3, all hazards, im a meteorologist, incident commander, facilities unit leader trainnee, im also doing my aviation safety training, A-100, through AIT.gov- DOI-USFS. I HAVE MY JOB AID FOR OIL RESPONSE, US COAST GUARD, SUPPORT FOR HAZARDOUS MATERIALS RELEASE TO THE MILITARY, hazardous materials inspector, international fire chief, fire manager, hydrologist(t), and doing aviation weather, emergency management. It was good I liked it a lot. This module has a nice format weaving otherwise disconnected topics together into a coherent presentation. A good overview for those unfamiliar with the Arctic. I like this module! I love this course. :) I was so happy because I had chance to learn arctic meteoroloqy for free. This course is enjoyable and I like the narrated mode. :)Sorry for my poor English. Meted! you guys are awesome! I appriciate.